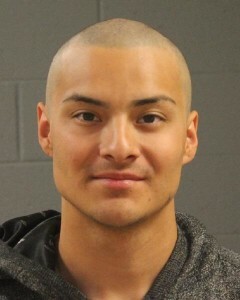 WASHINGTON CITY – A 21-year-old Washington City man was arrested Saturday for allegedly burglarizing multiple vehicles following a reported domestic violence incident. According to court documents filed Monday, Keith Bergman is alleged to have been involved in a family fight Friday night in the North Quail Ridge Drive area. Bergman left the home on foot following the fight. Soon after, three individuals said he was found in a vehicle parked in an attached garage at another residence. Those individuals chased Bergman to the home where the family fight had occurred and intended to keep him there until police arrived, court documents state. Three vehicles were reported burglarized with various items taken, including a 9 mm pistol. A Washington City Police officer met with the burglary victims Saturday and spoke with the woman involved in the family fight. She told police she found items in her home that matched items taken from the vehicles, the officer wrote. Bergman was identified by both the woman and the other alleged victims as the possible suspect in the previous night’s incidents. The officer then noticed a man matching Bergman’s description walking toward the residence. When Bergman saw the officer, he waved his hand in the air and pulled his shirt up to his chest while keeping his hands visible. When asked to verify his name, Bergman “placed his property on the ground and laid on his belly, making the statement ‘public defender,’” according to the probable cause statement. Bergman confirmed his identity and invoked his right not to speak to police without a lawyer present. He was also identified by the individuals alleging he burglarized their vehicles. Bergman was arrested and booked into the Washington County Purgatory Correctional Facility on felony charges related to theft, burglary of a dwelling and possession of a firearm as a restricted individual. He was also charged with multiple misdemeanors for vehicle burglary, theft and other charges related to the domestic violence incident.